Yeah, it may sound crazy, but you can actually get stamps “on sale” right now. Here’s how you can get this great offer too! 1. Register or Sign up at Shop at Home. For you first timers, you will get $5.00 deposited into your account. 2. 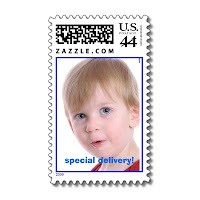 Search for PhotoStamps and then go to the photostamps.com website. Be sure that you go to it THROUGH Shop at Home. 3. Upload your photo and edit or crop it to fit into the space provided. Add borders, images – whatever you want to add your own personal flair. Then, head to the checkout. 4. Purchase at least 2 sheets, which will cost you $16.99 each. You can order more, but this deal is based upon the purchase of at least 2 sheets. 5. Input the promo code: thirtyoff. This gives you 30% off of your purchase price. 6. Input another promo code (as you can stack them): cutekid12 (this offer will get you free shipping on top of your 30% off savings). 7. Your total at checkout for 2 sheets will be $23.79. Then, you will get a rebate of $8.00 credited to your account within 30 days, making your total out of pocket $11.79 or only $0.40 per stamp. And, if this your first Shop At Home purchase, you will have another $5.00 back, dropping this price down to $6.79 out of pocket for two sheets of stamps! Now, a few cents may not sound like much, but pennies quickly add up to big savings! Don’t forget to enter my $100.00 Shop at Home Gift Card giveaway. You can also get a great deal on holiday return address labels too!